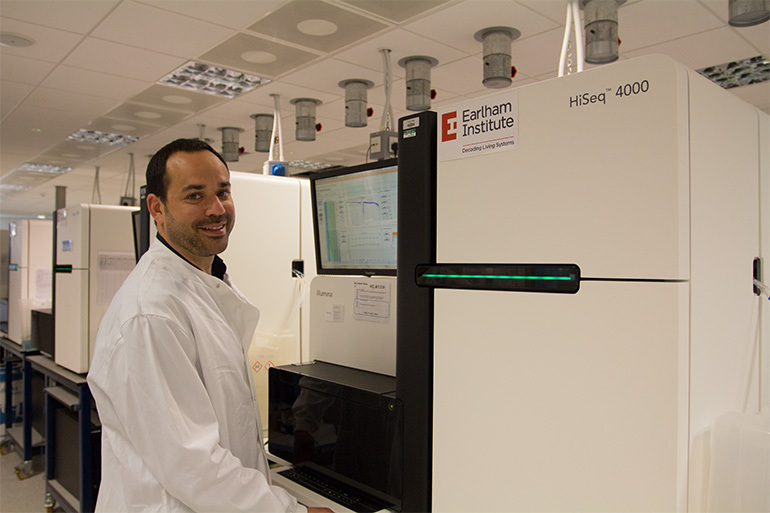 Dr Karim Gharbi has joined the Earlham Institute as Head of Genomics Pipelines to lead our UK National Capability in Genomics. Dr Gharbi will lead the Genomics Pipelines Group and oversee the Institute’s state-of-the-art DNA sequencing capability, providing EI and bioscience researchers with pioneering infrastructure for data-intensive science, backed by one of the largest high-performance computing (HPC) data centres dedicated to life sciences in Europe. Dr Gharbi has been at the forefront of next-generation sequencing since 2009, including leading roles in setting up and operating the Medical Research Council (MRC) High Throughput Sequencing Hubs in Scotland and managing the Edinburgh node of the Natural Environment Research Council (NERC) Biomolecular Analysis facility. He contributed to over fifty papers across the next-generation sequencing portfolio and also led the University of Edinburgh’s MSc (Master of Science) course in Next Generation Genomics. Dr Gharbi earned his PhD from AgroParisTech and the French National Institute for Agricultural Research (INRA) and was a postdoctoral researcher at the University of Guelph (Canada) before his Kelvin-Smith Fellowship at the University of Glasgow. “EI is an outstanding Institute and a hotbed for genome science. I’m delighted to join the team as Head of Genomics Pipelines and look forward to working with my EI colleagues and the wider genomics community to tackle global issues through technology and innovation,” said Dr Gharbi. At the cutting-edge of advanced sequencing technology for bioscience, research and innovation; EI’s diverse range of genomics and bioinformatics projects improve human, animal and plant health - while tackling global issues of food security, climate change, environmental conservation and human well-being.